Even in balmy Monterey County, winter nights are made for snuggling by the fire. Whether you&apos;re looking for a scenic view, for people-watching or for a view made just for two, you&apos;ll find your fireplace on this list. 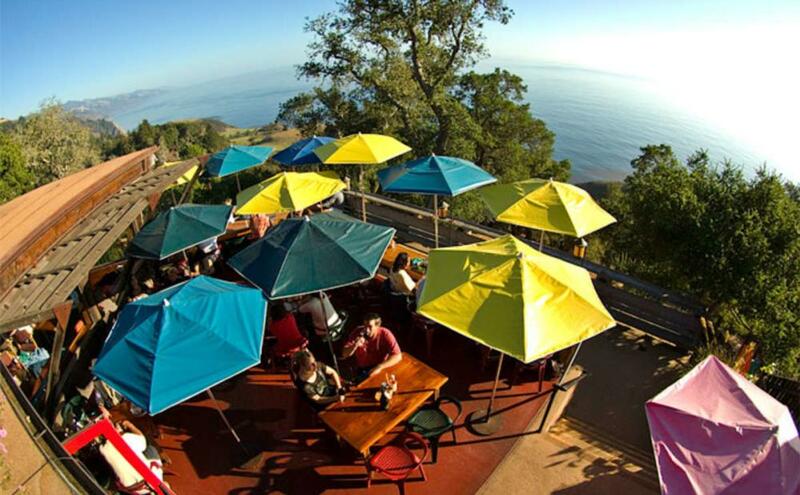 The fireplace on the front deck of Nepenthe has been a gathering place for visitors to Big Sur for over 50 years. Dine on a delicious ambrosia burger as you admire the Big Sur coastline and watch hawks soar through the clouds above your head. The Big Sur River Inn Restaurant is nestled in the middle of a redwood grove next to the Big Sur River. Seats in front of the fireplace will give you a perfect view both of the redwood grove and the fascinating regulars at the restaurant. 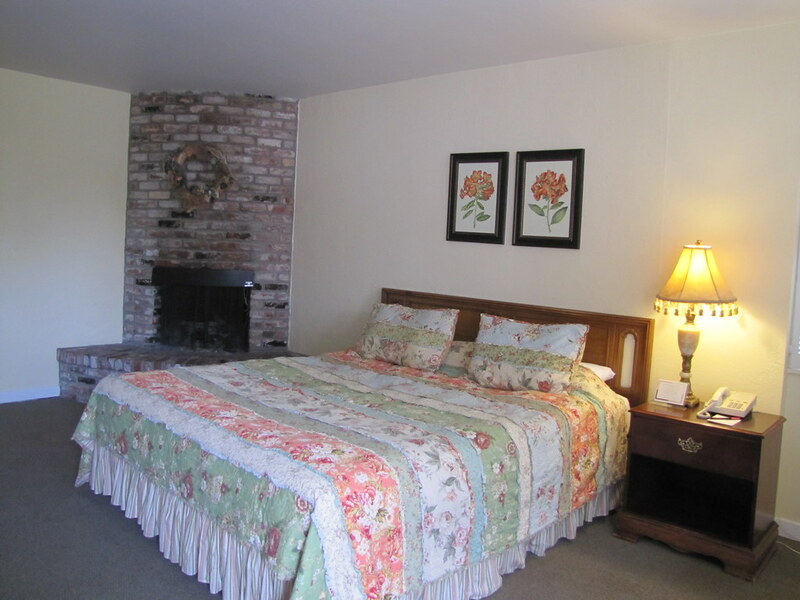 One of the most luxurious views for two in Monterey County can be found at the Post Ranch Inn. Every ocean front view has a fireplace with an ocean view, but the most special is the Ocean Room House, which also has a Jacuzzi tub for two opening up to the deck. Watch the sun set over the ocean while you sip a glass of wine in front of a wood-burning fireplace at Hofsas House. Third and fourth floor rooms provide some of the best views of the ocean in Carmel-by-the-Sea. Snuggle in front of the corner fireplace in a Superior King Suite at the Tally Ho Inn, and enjoy a glass of wine as you gaze over Carmel&apos;s beautiful cypress trees to the ocean beyond. You can also enjoy your view from the private balcony, or retreat to the Jacuzzi tub with a built-in TV for even more relaxation. The Hyatt Carmel Highlands is perched on a Carmel Highlands hillside, and its Fireplace Lounge has dramatic views of Point Lobos and the Big Sur coast, as well as cozy seating, a blazing fire and wonderful art. Sip wine, enjoy small plates from the renowned Pacific Edge and enjoy the view. Score a seat at one of the fire pits on the upper deck of Salt Wood Kitchen for a great view of Marina State Beach. During the afternoon you can watch the hang gliders take to the air; as evening comes, watch the sun set over the ocean. 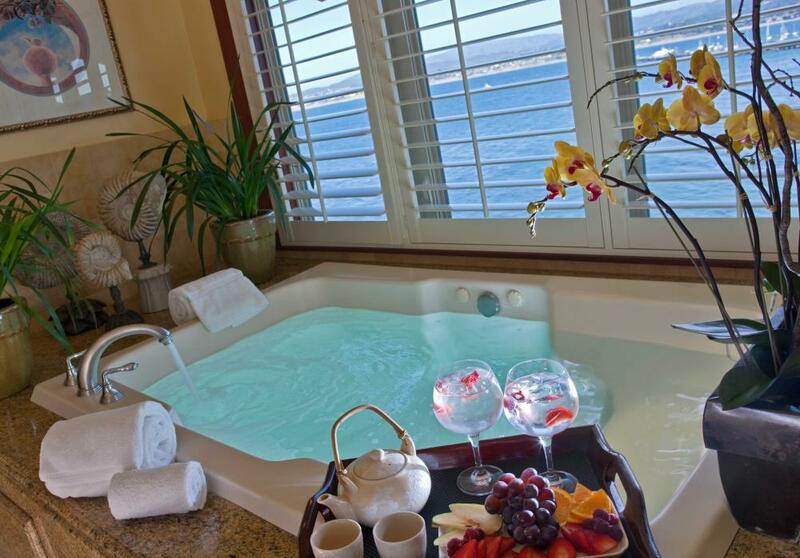 Relax with a great spa treatment, a crackling fire, a hot tub and a sweeping view of Monterey Bay. The rooftop sundeck at the Vista Blue Spa on the penthouse level of the Monterey Plaza Hotel and Spa commands 360 degree views of the Monterey Peninsula. Intercontinental the Clement Monterey has become a local favorite for its gorgeous Monterey Bay views from the fireplaces on its patio. Enjoy a cocktail while admiring the bay. For a more private view with fireplace, reserve a one bedroom luxury suite in Building A, or one of the coveted ocean-view rooms with fireplaces. The Spindrift Inn on Cannery Row offers a storybook setting within which to enjoy a crackling wood fire and beautiful ocean views. Admire the view from your window seat, or snuggle in a custom-designed canopied feather bed. Soak in the view by the fire while you immerse yourself in the deep bathtubs at the Captain&apos;s Inn at Moss Landing. Every room has a perfect view of the water. 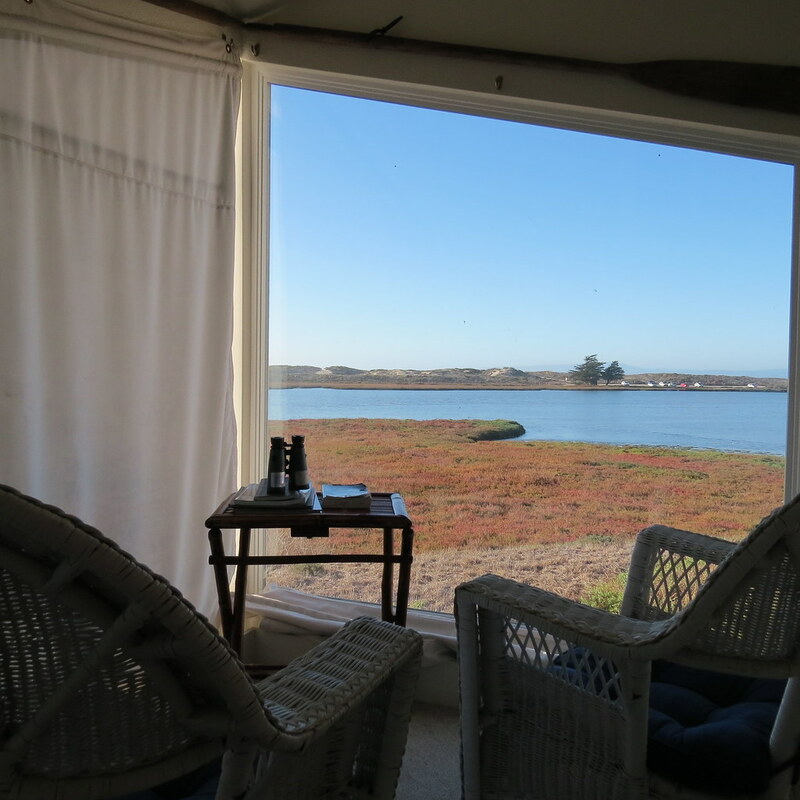 You may spot egrets, herons, otters and sea lions from your window. The Green Gables Inn has a drop-dead view of the ocean. The best views at the inn can be found in the uniquely decorated Carriage House rooms, where you can luxuriate in front of the fire while looking at the Pacific Grove coast. The scent of a genuine wood-burning fireplace just can&apos;t be beat. Enjoy the smell as it mingles with the ocean breezes when you stay at the Martine Inn. Sit in front of the fire in your private room and watch the waves crashing below with panoramic views of the Monterey Bay, rocky coastline and surrounding mountains. 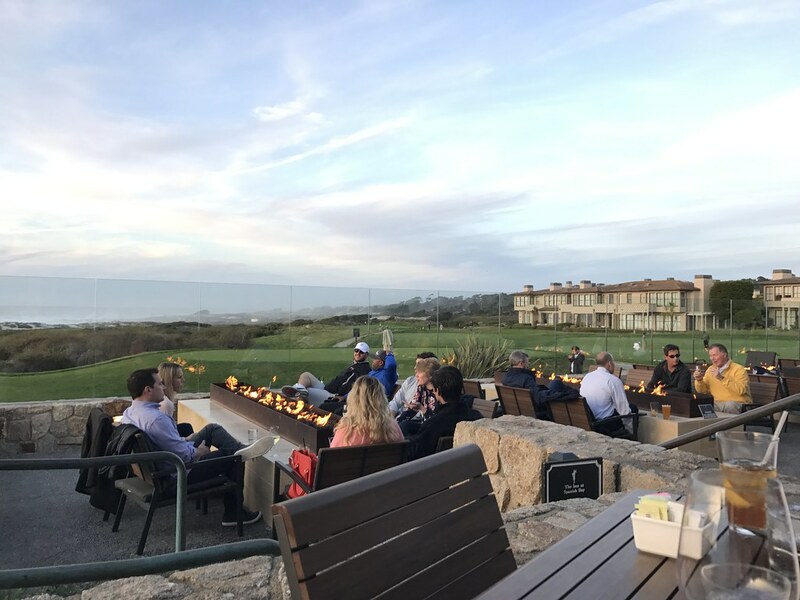 Sit by a fire-pit at the Inn at Spanish Bay and sip a cocktail while you watch the famed bagpiper serenade the sun as it sets over the golf course and Pacific Coast surf. For even more fireplaces with great views, stay at the Lodge at Pebble Beach, where almost every room has both a wood-burning fireplace and a stunning view of the coastline, the golf course or both.